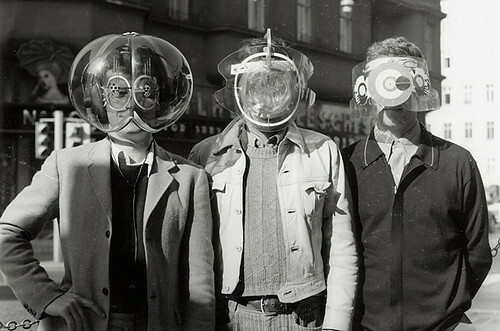 Not to be outdone by their British compatriots, the North American members of the League of Peculiar Gentlemen were also adept at strapping strange things to their faces. Perhaps the most famous of the trio, is Larry “The Monocle” Zimmerman, pictured in the middle. The Monacle was one of the first superheroes to appear in the United States, and after he single-handedly defeated the Rodent Armada of the evil genius, Herr Zamboni, the CIA recruited him to the League. His “monocle face” was able to focus his intense self-loathing into a powerful “ennui” beam, causing his enemies to stop whatever they were doing and hang out at jazz cafes, smoke cigarettes, wear berets, and generally make them unable to foment communist rebellion in the Americas. The lone Canadian on the team (right) was Roy “The Shelver” McMurphy, and his face-covering did not do anything except obscure his vision, which is probably why The Shelver was the first casualty on the team. However, it was McMurphy who deduced that his girlfriend, Pamela Lipwaxer, was an agent of the Committee for the Advancement of Stalin’s Mustache (CASM); this information was vital in giving the League their first victory over CASM’s hairy plots. Not pictured: The Mexican member of the team, Don Colitas. Read The League of Peculiar Gentlemen: The Brits. Feeling heroic? Buy a book! Alltop is the first casualty of humor. ohboys, a photo by Foxtongue on Flickr. Originally published May, 2012.